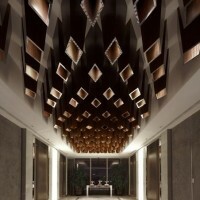 Kokaistudios have designed the Yu Bar at the Marriott Hotel in Shanghai, China. 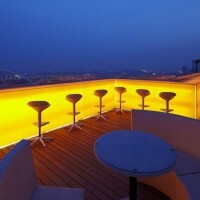 The Yu Bar is the glamorous new rooftop bar of the newly opened Shanghai Marriott Luwan. 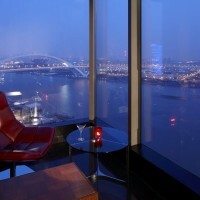 Located on the banks of the Lupu River overlooking the Expo 2010 site and the Lupu ridge the bar is located on the 28th and 29th floor and features a large terrace offering guests phenomenal views of the city. 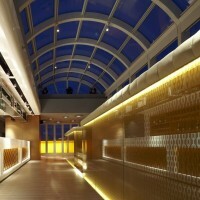 Developed by one of China’s top real estate developers, the Greenland Group, and managed by the Marriott Group, Kokaistudios received the brief to oversee the architectural design of a glass pavilion on the roof and all of the interior design for this unique location and our aim was to create a multifunctional venue suitable for a wide variety of occasions. Split over 2 levels the bar is characterized by a series of different moods and experiences all of which back-stopped by incredible views. 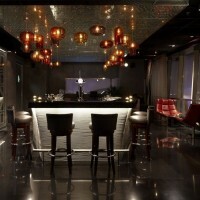 The name of the bar, Yu, is a classical Chinese character which symbolizes elegance and exclusivity. It is the inspiration of the design to combines nostalgic touches and contemporary decor, blending traditional Chinese flavor with Western romance. 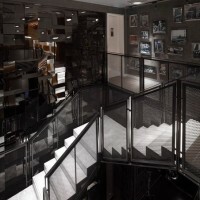 The concepts formed the starting point for the development of the design concept which Kokaistudios took in new contemporary directions which become apparent the moment guests step off the elevator where they are greeted by with sleek wood blocks and a stainless steel ceiling. 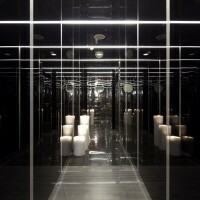 The entrance area of the bar is a corridor surrounded on all sides by sleek dark glass cabinets with dramatic lighting effect which create a strong atmosphere. 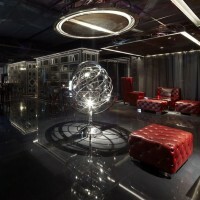 The VIP area over looks ceiling height windows and is full of old style chesterfield custom designed red leather sofas all centered around a dramatic stainless steel globe and an air of exclusivity; privacy and intimacy is given by the sliding curtains and dim lighting. Taking inspiration from the neighboring river and the importance that shipping has played in Shanghai’s development we developed a boat inspired U shaped bar covered in thick steel cables and characterized by its myriad hanging blown glass lamps. Separated from the main DJ stand by a small dance-floor this spaceoffers spectacular views of the passing ships. The hexagonal mosaic finished bathroom designed in complete black and white giving a vintage look with a modern flair. A sleek flying staircase leads up a brightly lit and wildly orange room located within the newly builtmodern-style glass pavilion; designed in a way to allow for the terrace to occupy the best views of the river and the neighboring sites. With a second bar and plush white sofas, the atmosphere is almost opposite from the dark and low-key first floor and is designed for lounging in the breeze and appreciating fine cocktails and wines almost as if one was on a boat on the river. 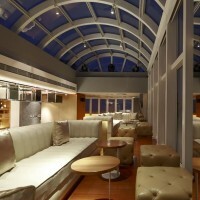 The entire top floor is designed to be rented out for private events and hosts a full bar and kitchen facilities. 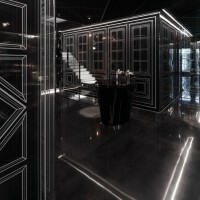 With Kokaistudios strong emphasis on the interplay between materials, furniture and lighting the Yu Bar offers a unique guest experience in Shanghai and satisfies the demand of dynamic guests looking for new sights, sounds and tastes all accompanied by great service and a stunning view. Visit the Kokaistudios website – here.